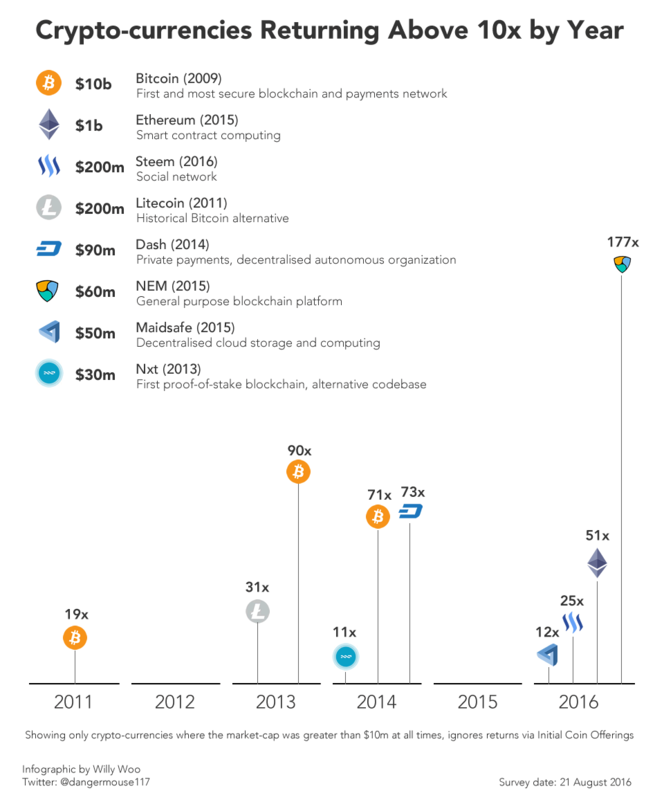 Below is a infographic of the top performing crypto-currencies achieving above 10x had you invested for up to one year and exited in any particular year. This analysis assumes the profile of an investor buying on an exchange (no ICOs or over the counter deals) and restricted to projects that have achieved $10m market cap as a proxy for liquidity and legitimacy. See footnotes below for my methodology. Without the $10m minimum, I calculate Bitcoin would have returned 592x in 2011! The altcoin space is really warming up, if anything, the trend is for more opportunity now than the early days of Bitcoin. Returns are calculated at the peak price within a given year, divided by the lowest price within the 365 day period prior. It’s easy to get 10x on small cap coins, pump and dump scam-coins, etc so market-caps below $10m at any time during the investment interval have been ignored, so for example Bitcoin didn’t achieve a $10m market cap until 23 April 2011, returns involving prices before this period are ignored. Initial Coin Offerings have been ignored, even if they exceeded $10m for reasons that apart from it’s outside of the profile of our investor, really there’s no market driven price discovery mechanism to show organic gains. Returns are based on USD equivalent invested. Data was extracted from Coinmarketcap.com and CoinDesk’s Bitcoin Price Index tool, the former does not have the full price history, did I miss any coins?